There is an instant fascination which this painting on panel offers the neophyte, as he identifies himself without any difficulty to the main personage – a scantily clad youth playing an antique harp, surrounded by a bevy of entranced females, some prostrate with admiration, others overcome by pure love. Orpheus, because this is precisely the identity of our lucky young man, appears to be oblivious to the ecstatic atmosphere he creates around him and he seems to be content playing on, regardless, while focussing his eyes on the horizon. The painting is luminous, in shades of ivory white which dominate the panel, punctuated by pale and discreet coloured draping in the guise of clothes and darker greens of erect poplars. These are Lombardy poplars of a kind that one very rarely sees in England, because the painter, although being English herself and trained at a London Art School, she sets her subject in Italy. Our painter is called Janet Cree. Born in London in 1910, she is an artist of early promise as the Tate Gallery acquires one of her works when she is only 23 years of age. From then on we know little about her artistic fortunes and true to herself Janet carries on quietly with her craft, sending regularly her pictures to the RA exhibitions, without making waves. Soon the war takes its toll as the art aficionados go silent and the bottom falls out of the art market. Platts-Mills is no exception. At first he hopes that luck may strike closer to the British Isles as he gives his support to the Republican cause in the Spanish Civil war. That was not to be. For a moment it seems that his political sympathies go astride the main flow of the British establishment, as he is not considered good material to enrol as a RAF pilot during the war. Earlier on, in 1932 he is called to the Inner Temple, but will not become a King’s Council for a long time, because of his political sympathies. But at the beginning of the war the Allied troops suffer many set backs, which cause Platts-Mills’ fortunes to change for the better, as Churchill calls on him to urge him to be a go-between with Stalin’s Russia. This is the time when Platts-Mills throws himself arduously into Soviet-British PR, forging endless Soviet-British friendship societies all over Britain. Yet, on the political board of snakes and ladders fortunes change quickly and with the advent of the cold war the maverick barrister looses his political clout: in the process he also looses his Finsbury seat in Parliament, as he is expelled from the Labour Party. But hard luck turns to good fortune as his reputation precedes him. He becomes a much sought-after lawyer in some of the most controversial legal cases, defending the Kray brothers, the Great Train Robbers, the Shrewsbury two. He also acts as a secret adviser of Trade Union leader Arthur Scargill in the miners’ strike of the 1970’s, which caused the fall of Edward Heath’s government. He appears on the Grunwick picket line and acted on the Bloody Sunday inquiry in Londonderry. But before he becomes involved in these high profile cases Platts-Mills takes care to pay his last respects to “Uncle Joe”, as he dies in the Kremlin, in 1953. His bedroom light is turned off late. Quite so! And to start with those working classes could drive Rolls-Royces by proxy, through their representatives like Platts-Mills…and drink champagne also through their representatives. In her old age, the faithful and dutiful wife never questioned and never complained: for her the personage in the centre of her youthful painting was no other than her good-looking husband, the very iconic Orpheus who never turned up for tea. 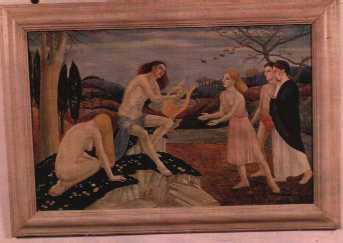 “Orpheus” is in a private Collection in London and according to one source the whole of Janet Cree’s atelier was acquired by the Tate Gallery after the painter’s demise.